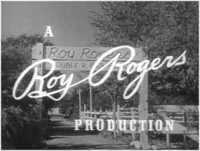 “The Roy Rogers Show” (1951 – 1957) debuted on television on December 30, 1951. It was a Western, action/adventure series that was set in the fictional town of Mineral City in Paradise Valley. Each 30-minute episode was filmed in black-and-white, and it aired on Sunday evenings on the NBC network for six successful seasons. After the show ended on NBC, the CBS network picked it up and showed it in reruns for the next four years. “The Roy Rogers Show” is still popular today, with a faithful fans of all ages watching the show on videos or DVDs. First was Roy Rogers, known as The King Of The Cowboys, riding along at breakneck speed on his faithful golden palomino stallion Trigger. Roy had made more than 80 movies with Trigger since the late 1930s and had purchased the horse for his own shortly after they first met. Trigger, as everyone knew, was The Smartest Horse In The Movies. After Roy and Trigger were introduced the credits moved along to Dale Evans, well-known as The Queen Of The West and Roy’s real-life wife. Dale was also riding at breakneck speed on her own horse, a beautiful buckskin named Buttermilk. Last, but definitely not least, Bullet The Wonder Dog was introduced, streaking along at top speed. Bullet, a German Shepherd, was also a Rogers family pet. The plot lines of “The Roy Rogers Show” were simple and comfortably familiar: Roy or Dale would find out about someone who was in trouble and needed help, and they would help them. The show was set in the town of Mineral City in Paradise Valley, with Roy’s character owning and running the Double R Bar Ranch and Dale’s character owning and running the Eureka Cafe in town. Every week they were assisted by Trigger, Buttermilk, Pat Brady (who had a Jeep called Nellybelle and a horse named Phineas), and Bullet. The setting for the show was slightly modern by most Western standards, with a phone in the Eureka Cafe and cars traveling the same dirt roads that Roy and Dale galloped Trigger and Buttermilk over. Even so, plenty of cowboy and Western action was packed into every show. There were always bad guys to catch, chase scenes with horses were a given, a good fist-fight or two could be counted on, and Roy and Dale both packed six-shooters on their hips in order to be ready to shoot a gun out of a bad guy’s hand at a moment’s notice. Roy and Dale were sweethearts on the show, but there was no mushy stuff here: What really stood out about their relationship was their friendship, respect, and trust in one another. Each episode of the show closed with Roy and Dale singing the chorus to the couple’s signature theme song, “Happy Trails,” which was written by Dale. In 1951, after starring in more than 80 highly successful movies, singing cowboy superstar Roy Rogers wanted to make the move to television. When his movie contract with Republic Pictures was up for renewal and a new contract was being negotiated, Roy asked for the right to do television shows. Republic refused, and Roy learned that the studio had plans to trim down the movies he had already made and turn them into television shows for themselves. Many years earlier, however, Roy had obtained a clause in his movie contract that gave him the rights to his own name and likeness. It was this clause that allowed him to successfully obtain a court order to stop the studio from taking his already-made movies to television. In retaliation, the studio fired him. Roy moved forward with his plans for a television show, producing the shows himself. “The Roy Rogers Show” debuted on December 30, 1951 and ran until 1957. There were 100 (some sources say 104) episodes of the show, all starring Roy Rogers and his horse Trigger, Dale Evans and her horse Buttermilk, Pat Brady and his Jeep Nellybelle, and Bullet The Wonder Dog. Part of the closing credits from “The Roy Rogers Show. “The Roy Rogers Show” debuted on December 30, 1951 on the NBC network. It was shown early on Sunday evenings, and ran for six successful seasons. The show aired its last new episode in June of 1957. After “The Roy Rogers Show” stopped airing new shows on NBC, the CBS network showed reruns of it for the next four years. The show was in black and white, and made a total of 100 (some sources say 104) half-hour episodes. Roy Rogers, The King Of The Cowboys. You can read our Roy Rogers biography here. Trigger, Roy’s palomino horse. Roy and Trigger had met in 1938 when Roy starred in his first Western movie, “Under Western Stars.” He purchased the horse for his own shortly thereafter. We have more information on Roy Rogers’ horse Trigger. Dale Evans. Dale was Roy’s real-life wife. They had been married on December 31, 1947. You can read our biography on Dale Evans on this page. Pat Brady. Pat Brady was a long-time friend of Roy and Dale’s. He was a member of the popular Western singing group founded by Roy, the Sons Of The Pioneers, and had appeared in many of Roy’s movies. We have more information on Roy Rogers and the Sons Of The Pioneers. Nellybelle, the Jeep. In the show Nellybelle was owned by Pat Brady. Even though Pat also had a horse named Phineas, he most often chose to drive Nellybelle. Bullet The Wonder Dog. Bullet was a German Shepherd that was also a Rogers family pet. You can see pictures of Bullet on this page. Buttermilk, Dale’s buckskin horse. In many of the movies Dale Evans had made with Roy Rogers she had ridden a palomino horse named Pal. For the television show, however, she and Roy were concerned that on a smaller television screen Pal would look too much like Roy’s palomino horse, Trigger. Dale got a new horse for the TV show, a buckskin gelding named Buttermilk. Post Cereals sponsored the show. The show took place in Mineral City in Paradise Valley. Roy Rogers and Dale Evans played sweethearts on the show, and were married to each other in real life. On the show Roy owned the Double R Bar Ranch, which was the same name as his and Dale’s home in Encino, California. On the show Dale ran the Eureka Cafe that was also a hotel. 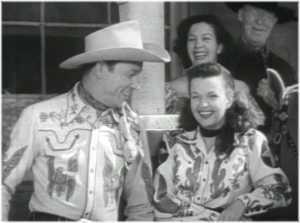 The show’s theme song was “Happy Trails,” written by Dale Evans. Roy and Dale sang the chorus of the song at the close of each show.